during the cold winter season. Boil potatoes in large soup pot - cook till tender. Boil carrots in separate small pot - cook till tender. When celery - garlic - onions are sauteed add 4 cups of hot water and 4 chicken bullion cubes to skillet. Make sure to cook and stir until the chicken bullion cubes are dissolved. When potatoes are tender drain and return to pot. Add sauteed celery, onions, bullion water to the potatoes. Take a masher and lightly mash potatoes. When you have mashed the potatoes add the carrots. Add spices & Bacon bites to taste. Simmer until ready to eat. I love soup. Potato is a favorite and I have a potato leek soup my whole family loves. I love potato soup! Yours sounds SO good! Potato soup is one of my faves. I like the looks of this... hmmmm. think I need to make some. My mom loves potato soup and she's coming to visit next week. I'll have to surprise her by making some. I don't have a good recipe for potato soup so you can bet I am going to try this one out. It looks very good. We have a potato soup recipe that my mom gave us. Love soups during the cold winter!! I love vegetable beef soup. This looks really tasty and I'm sure my husband will love it. I wish I lived next door to you so I could pop over for a bowl! That looks like the perfect lunch for a rainy day like today. This potato soup looks so good. I love making home made soups in the crock pot during the winter time. I love soup especially when it gets cold out. Thanks for the recipe I have never made potato soup. I just love potato soup. We made the SkinnyTaste version where you replace a few taters with cauliflower. It was so good and my family didn't even notice it was lower in calories. Yum! My whole family loves hearty meals like this. It's such a comfort food. This looks really tasty. I love potato soup, and this is a great recipe. Thanks. I just had some clam chowder, soup is so good. I will definitely add your recipe to my list. Potato soup is one of my favorites. I just whipped up a batch of it this week. This looks delicious. I've been all about soups lately, I should give this a try! Yum I love potato soup! My favorite soup would have to be chicken and dumplings, though. I love potato soup in the winter, it's such a great comfort food. This sounds absolutely delicious. I think I would double the celery for my part. But for the kids, doubling the bacon bits is great! I love making soups. Adding this one to my meal plan! Sounds like a great recipe. Some of my favorites are potato soup, broccoli soup and french onion soup. I have never made a potato soup before! This looks really good. I have tons of favorite soups! I do love potato, and stuffed pepper, and lentil with ham! We love potato soup in our house. We top ours with cheese and bacon. I have never tried making potato soup. My favorite soup to make is Lasagna soup. Mmmm I just love soup on a chilly winter evening. This looks delish! I just bought everything to make homemade chicken noodle soup but this looks even better! I love easy winter meals! This looks reall delicious. It looks diferent from what I am used to in a potato soup and I like being able ot see all the pieces of potatoes and other vegetables. I love potato soup! This recipe sounds delicious! I have never tried potato soup, but I just might. This winter is already cold for me I could use some hot soup right about now. I love butternut squash soup. Potato soup sounds like a delicious winter soup and would make an amazing comfort food. Potato soup is in my top 3 faves. This one looks good. I was looking for this recipe and I found yours. I'll try it today! 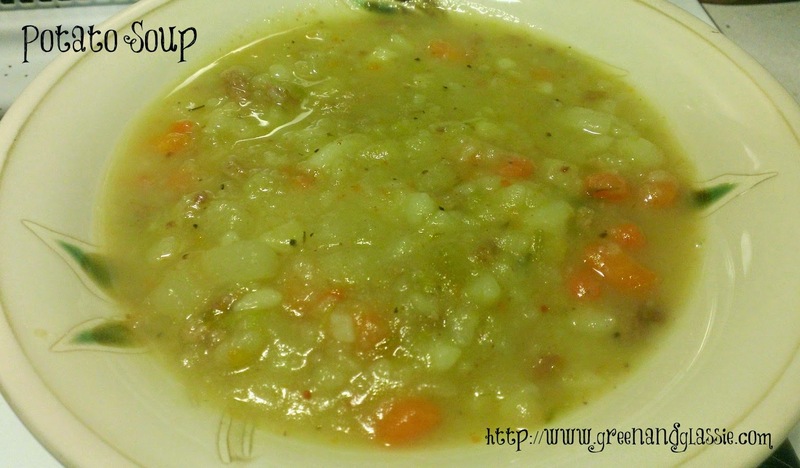 What a great soup to make on a chilly winter day. Potato is such a tasty veggie and makes nice soup. That's so funny. I was going to make a baked potato soup today! I love soup! My favorite is chicken barley. My favorite soup is a creamy cheese potato soup I order every now and then. So good. I am such a fan of potatoes. Mmm! Love potato soup! I've been on a huge soup kick lately.